The sun is shining brightly today and I grabbed the opportunity to take some pictures of the dining room in all it's Christmas finery. I have been collecting the retro deer for the past couple of years. They are hard to find. The large one is reproduction, the other is vintage, flocked. I took some Christmas sheet music to Kinkos and had it made into 24 x 36 inches and then cut it into snowflakes. Three of them fit my 72" round table quite nicely. This is a picture of the back side. Lots of glittery, snowy wonderfulness (how is that for a description?) Oh, how I love this time of year. I would wear glitter and sequins daily if I could! 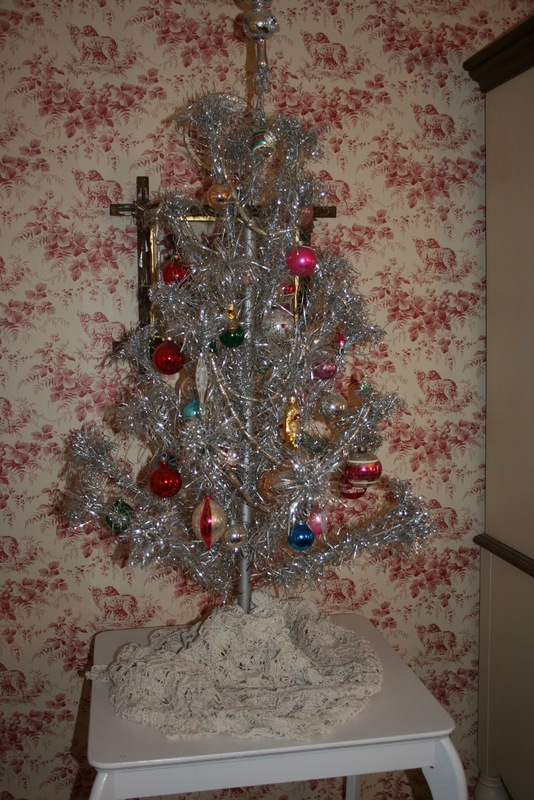 My little vintage silver tree is in need of a tree skirt, for now a lace tablecloth does the job. I either need to make one or find a vintage one thats not very big. I add a couple of new vintage ornaments every year. This little tree I decorated a few years back. The garland is sheet music. The ornaments are old pieces of jewelry, buttons, tiny ornaments and even the ballerina from a music box. The star I made with felt and an old beaded applique from a long ago garment. The pillows are new this year. I bought them on sale at Pier 1. They sit next to a wonderful snowman that I purchased at a craft show when my kids were little. 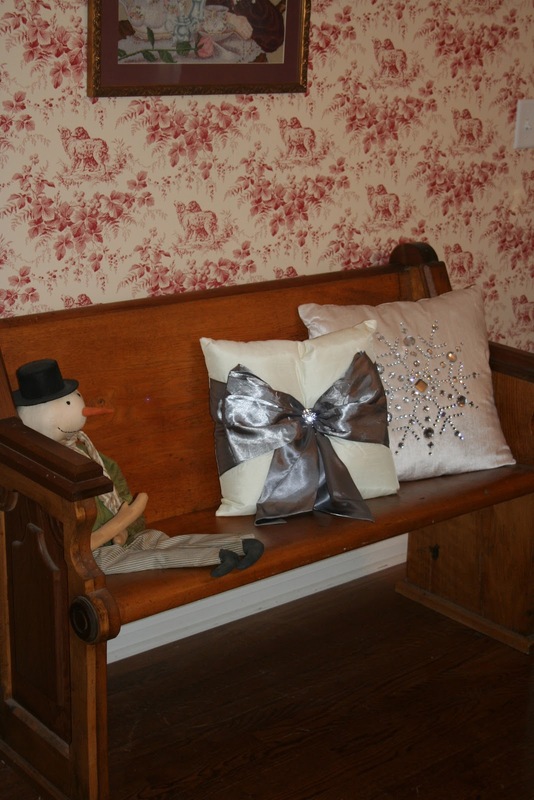 The church pew is the very first antique I ever purchased. I have often thought of painting it a different color but in the end I love imagining it just as it was in the church it came from, with another traveler through life praising God at Christmas time. Lastly, my favorite nativity, the one my Mom cross-stitched for me years ago. It is the most important decoration in the house, the reason that we celebrate this Christmas season. God coming to earth, to his people, to gather us back to himself. Oh how precious he is, our Lord and Savior! My mom cross stitched that same nativity for me years ago! I love it! You have lovely Christmas decorations. I love your nativity. I've never seen a cross-stitched one before. And how cute are those little deer! 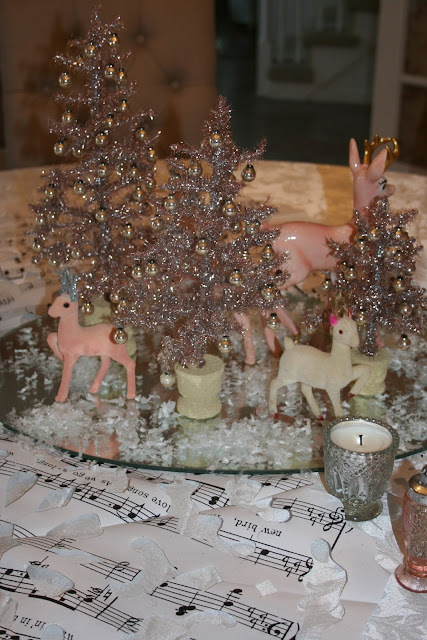 It's been lovely seeing how everyone decorates around blogland. The church pew is gorgeous -- I love how you've left it in its original state. The cross-stitch nativity scene is beautiful; what a treasured gift that must be. My nativity set is up much higher this year, away from little hands which means its not the first thing visitors see when they enter our home. But we do have a nativity scene in lights on the front roof so everyone who passes by is reminded of the real meaning! The rest of your house looks so pretty too. 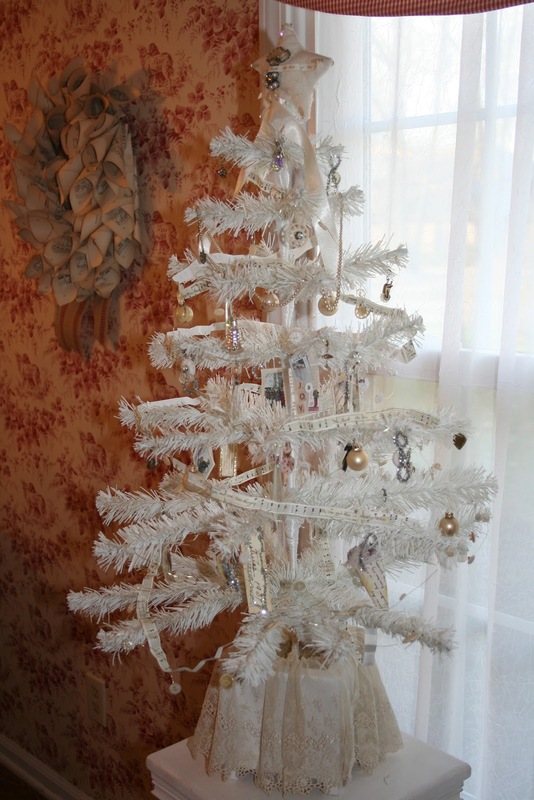 Oooh, I love the little silver trees and the white tree and the pillows, and well, everything! Sunshine in the winter is a special treat isn't it? Hi Renee, What wonderful decorations you have! 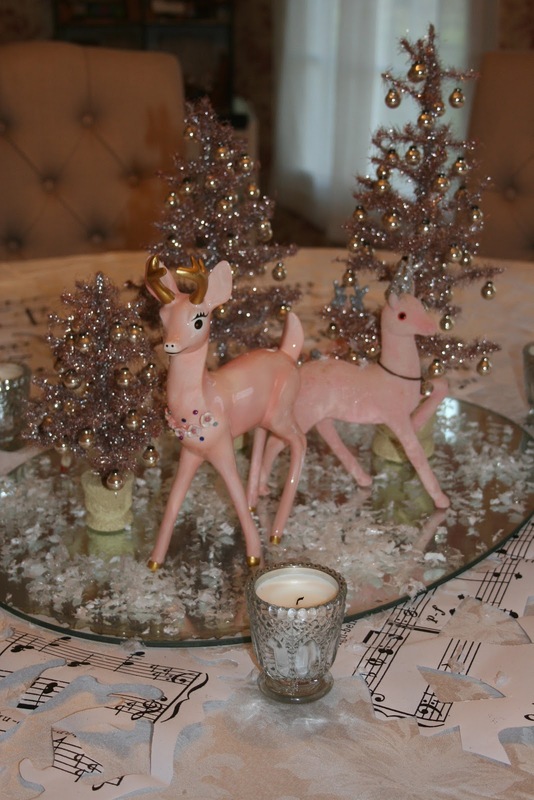 The table looks perfect and the deer are precious. Love the manger. All of your decorations are very nice. I LOVE your nativity. How special that it was hand made with love for you. Enjoy this most blessed and holy season. Love your church pew and I think it's beautiful as it is! How special the nativity is! Love your little trees too!